Changing up just one thing in your kitchen can make a huge difference in function, appearance, and value. Especially when that one thing involves adding new kitchen countertops in Hammonton, NJ. Since countertops cover such a large area, they draw lots of attention. Choose stone countertops for high-end beauty and practical value. Our local store is proud to provide you with a number of stunning options in countertop selections that include quartz and marble. Come into our showroom and ask our sales and design professionals to show you samples of quartz and marble counters and to explain the merits of each. Sometimes, it seems that everything in your kitchen is in competition for counter space. After all, this is valuable real estate in your kitchen with small appliances competing for space with food preparation. Let us help you make the most of this limited space with our design services. Our designers assist you in figuring out countertop space, working to maximize what you have. These professionals also educate you on the benefits of the different materials used for counters and help you choose what works with your requirements and preferences. Two of the most popular choices include marble and quartz. Engineered quartz countertops are improved during the manufacturing process. A little bit of resin and pigment are added to this natural stone. The resin bonds the quartz, making it a solid surface, while the pigment provides great variations and intensity in color. Solid surface countertops are prized because liquid and food cannot penetrate the surface. This results in a countertop that is easy to clean and one that is hygienically clean. This is because bacteria and germs cannot escape into tiny holes or cracks and contaminate food. 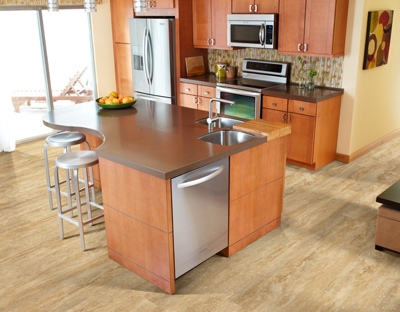 Our engineered quartz counters are available in brand names, such as VICOSTONE, Cambria, and Viatera by LG Hausys. In addition to quartz, we carry marble countertops. Marble is natural stone with distinctive veining that offers great visual appeal. Marble makes stunning countertops that are great for the kitchen as this stone remains cool to touch. As this is a soft stone, it is easy to shape, cut, and install. Ask our store to arrange professional countertop installation. This is not an area where you can afford any mistakes. Measurements must be precise and placement exact to line up with the sink and stove. We can arrange to have experienced professionals install your countertops for you. Contact us today for a free, in-home estimate on new kitchen countertops. We proudly serve customers in Hammonton, Cape May, Vineland, Ocean City, and Atlantic City, New Jersey, and the surrounding areas.